Another cache in the Village Signs series. Please note that the actual sign is not at the published coordinates but can be found at the waypoint listed below just outside the church. The modern parish of Streatley is part of South Bedfordshire District. It is bordered by the Borough of Luton to the south, the Bedfordshire parishes of Sundon to the west, Harlington to the north west, Barton to the north east and the Hertfordshire parishes of Hexton and Lilley to the east. The population is formed from the village of Streatley and the hamlet of Sharpenhoe together with a small part of the Bushmead area on the edge of Luton. There is no sign of permanent settlement until the village of Streatley is mentioned in the Domesday Book, Streatley with Sharpenhoe was mostly given to pasture or jointly managed arable fields with areas of woodland. 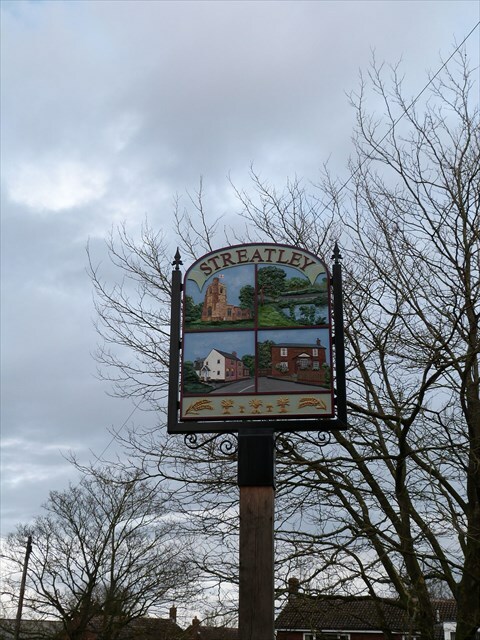 Streatley means “the clearing by the street”, which indicates that an important road or track (possibly Roman) may have passed the village. Sharpenhoe (scearpan-hoge) means “sharp spur of land” and refers to the Clappers below which the village lies. The villages were badly affected by the recession in the later medieval era, when the Black Death was rife and a shortage of food added to the misery, this led to a drop on the population for some time. By the 19th century Streatley was a rather loose arrangement consisting of a Church, four main farmsteads and other houses and cottages strung along the road. Bunyan was a frequent visitor to the area and was arrested nearby and taken to Bedford Gaol. It is thought that the Clappers was his “Delectable Mountain”. There is ample parking next to GZ. If anybody would like to expand this series please do. I would just ask that you let http://www.geocaching.com/profile/?guid=52cc3744-888f-4b29-a97b-2b14c01b853d&wid=37b539c6-894c-42d6-bbb6-d2bbd78b220c&ds=2" Smokeypugsknow first so they can keep track of the Village Sign numbers and names to avoid duplication.